Scientists Want to Build a Robotic Albatross. Here's Why. The wandering albatross is showing engineers how to build drones that can fly enormous distances while consuming little energy. Birds have inspired airplane designs since the dawn of aviation, but nature isn’t done giving up its secrets. Now researchers are taking cues from the wandering albatross (Diomedea exulans), an enormous seabird that is uniquely adapted to soar great distances with minimal effort. Their goal? Design new drones that fly by harnessing power from the wind and sun. The drones would be ideal for missions to remote regions where there is no place to recharge batteries along the way. Albatross-inspired drones could lead search and rescue efforts or patrol protected marine areas to make sure no one is illegally fishing in them. The drones could also collect atmospheric data that would allow meteorologists to better forecast the paths of hurricanes and storms. The wandering albatross uses its impressive 11-foot wingspan to glide over huge swaths of the ocean. But its gliding prowess comes from more than just its reach — the bird’s coloration also plays a key role. Like many other seabirds, albatrosses are black on top with white bellies. Researchers recently showed that black feathers absorb more solar energy, and when the darker feathers heat up, this temperature difference lowers air pressure on the upper surfaces of the bird’s wings. That creates lift and cuts down on aerodynamic drag, allowing the birds to slice through the air more easily. An albatross-inspired drone could stay aloft longer and use less power than a typical drone, says Abdessattar Abdelkefi, assistant professor of mechanical and aerospace engineering at New Mexico State University in Las Cruces. He and his colleagues want to mimic the shape and color of albatross wings to design a battery-powered drone with better endurance. Elsewhere, researchers are taking this biomimicry a step further. Unlike other birds that flap their wings frequently, the albatross rides the wind, sometimes traveling more than 600 miles a day while barely flapping its wings. 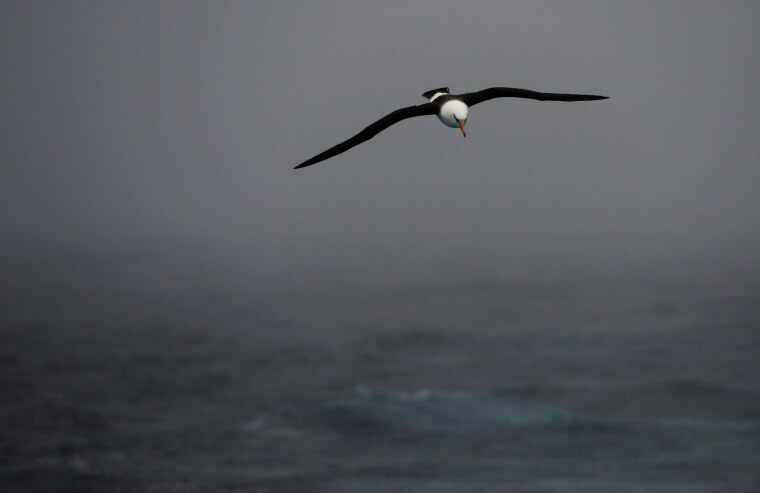 “Flying is super easy for the albatross, and that’s totally different from other birds,” says Gabriel Bousquet, a graduate student in mechanical engineering at MIT who is also working on new drone designs. He and his colleagues recently used a computer model to explain how albatrosses fly so efficiently. It turns out the birds make gentle zigzag motions as they climb and descend, a technique that reduces drag and helps albatrosses fly 57 percent faster. The results of this study were published online Oct. 4 in the Journal of the Royal Society Interface. Bousquet and his colleagues are designing a fixed-wing, wind-propelled drone that they hope will be able to fly overseas without stopping — and without relying on a traditional motor. This “robotic albatross” will likely be shaped like a traditional glider, he says. But to make it nimble enough to fly like an albatross, the team may borrow some design features from fighter planes, such as small forewings called canards. Bousquet added that the drone could be available within four years. But while these magnificent seabirds are influencing drone designs, don’t expect to see any of these features on passenger planes; researchers say the benefits translate best for drones that are about the size and speed of an actual albatross. And soaring like an albatross would make for a miserable commercial flight. “I don’t want to be in an airplane that does this crazy zigzag maneuver for eight hours,” Bousquet says.